Whether you are on the hunt for the perfect Jack-O-Lantern, or just want a festive spot for a fall family photo op, there are pumpkin patches aplenty in Austin and beyond. We’ve rounded up pumpkin locales both near and far, along with the dates the patches and farms will be open this fall. The Pumpkin Patch will be open October 5 – 31, 2013 (or until the pumpkins run out, which may be earlier). Hours will be Monday to Friday, from noon – 6:30 p.m. and weekends from 10 a.m. – 6:30 p.m.
At this annual Pumpkin Patch, you can find more than 2000 various sizes of pumpkins for sale. On the weekends, there will be storybook readers for children, children’s activities, and great picture opportunities. Open October 11 – 31, 2013, from 10 a.m. – 7 p.m. 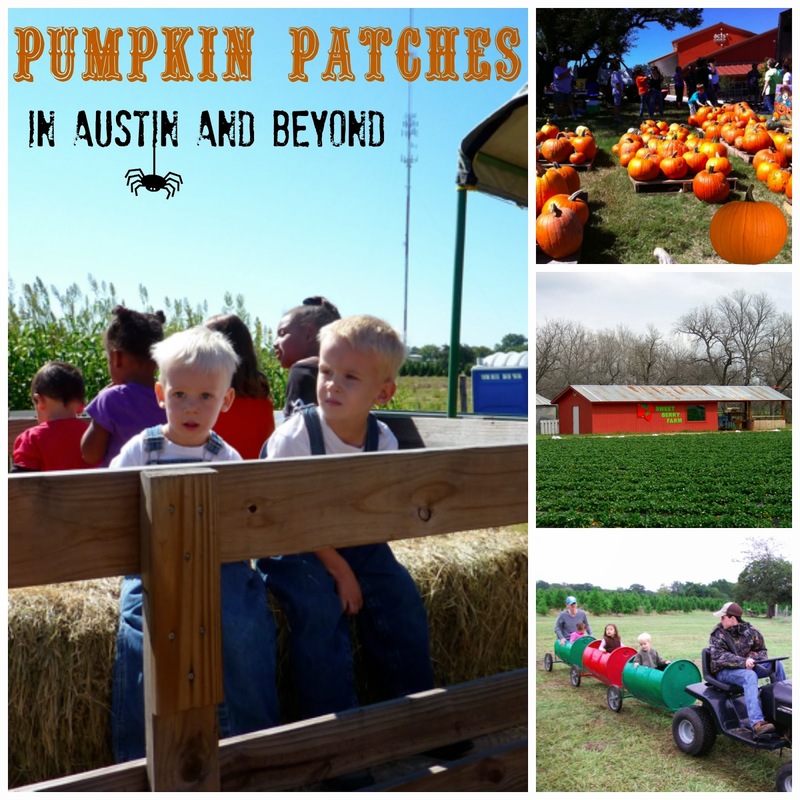 The FEFC Pumpkin Patch will be open to the entire Austin community October 13 – 31, 2013. Come take photographs and pick out the perfect pumpkin for your family! All proceeds go to Redeemed Ministries, an organization that advocates against human trafficking and works to care for survivors. Pumpkin Patch Hours: Monday-Friday: 7:30 a.m. – 7:30 p.m.; Saturday: 9:00 a.m. – 6:00 p.m.; Sunday: 10:30-11:00 a.m. and 12:30-1:30 p.m.
Pumpkins are on sale now. A special fall festival is planned for Saturday, October 19, 2013, from 10 a.m. to 4 p.m. This free event will feature a moon bounce and a petting zoo. Open October 7 – 31, 2013 (unless the pumpkins sell out before Halloween). The Pumpkin Patch will be open daily, from approximately 10 a.m. to 7 p.m. Call the church at (512) 452-5737 for more information. The Pumpkin Patch will open for the season on Monday, October 14, 2013. It will be staffed in the mornings and late afternoon/evenings. In the mornings, starting every half hour from 9 – 11 a.m., children are invited to enjoy stories in the Patch. The Pumpkin Patch will be open daily from October 1 – 31, 2013. The hours of operation will be: Monday to Friday, from 2 – 7:30 p.m.; Saturday, from 9 a.m. – 7:30 p.m.; Sunday, from noon – 7:30 p.m.
Pumpkin Palooza is taking place Friday, September 27 – Sunday, September 19, 2013. Visit for pumpkin samples, games and giveaways across the store from 12-5 p.m. each day. The Pumpkin Patch will be open daily from October 1 – 31, 2013: weekdays, from 9:30 a.m. – 12 p.m. and from 4 – 7:15 p.m.; Saturdays, from 9 a.m. – 4 p.m.); Sundays, from 12 – 4 p.m.. There will also be a Fall Festival on Saturday, November 9, from 12 – 9 p.m. (this was rescheduled from an earlier date, due to inclement weather). Kids who are 3 years and younger enter for free. For everyone else, admission is $6 per person in advance (before Oct. 19 at the Twin Lakes Family YMCA Member Services Desk in Cedar Park) or $8 per person at the gate. The Pumpkin Patch will be open October 6 – 31, 2013, from 9 a.m. to dusk. The Pumpkin Patch will be open September 28 – October 31, 2013. Sunday – Friday, open noon-dark; Saturday, open 9 a.m. – dark. The Great Pumpkin Festival is a FREE event that will be held on Sunday, October 20, 2013 at 3 p.m. The pumpkin patch will open for business on October 13, 2013. The pumpkin patch will be open October 6 – October 31, 2013. Hours of operation are 4:30 – 7 p.m. on weekdays and 9 a.m. – 7 p.m. on weekends. The 8th annual Kyle UMC Pumpkin Patch will be open from October 12–30, 2013. It will be open Monday – Friday, from 2:30 – 6:30 p.m., Saturday, from 9 a.m. – 6:30, and Sunday, from noon – 6:30 p.m. The Pumpkin Patch will be open October 5 – 31, 2013. Visit the patch, purchase a pumpkin to carve, take photos and join in celebrating the cool breezes of fall and the changing colors of the season. The MUMC Fall Festival will take place on Saturday, October 19, 2013, from 11 a.m. – 3 p.m. The MUMC Fall Festival is a great time to celebrate the season! Bring your family, friends and neighbors for a day of fun! The Festival will include family fun, a hay ride, children’s games, a moon jump, food, a cakewalk, crafts, prizes, clowns, music and more! FREE. Open weekends from September 28 – November 10, 2013. Saturdays, from 10 a.m. – 10 pm. and Sundays, from 10 a.m. – 5 p.m. Admission is $10 for adults and $7 for children. You can save $1 if you purchase tickets online. Barton Hill Farms boasts a 5-acre corn maze, frontier games, a pumpkin patch and more. Open weekdays and the first and fourth weekends in October for $6 admission (ages 2 and up). The Pumpkin Festival will take place on the second and third weekends in October for $6 admission for kids (ages 2 and up) and $8 for adults. Activities are included in the price of admission. There will be hayrides, mazes, kiddie train rides (weekends only), playgrounds, pumpkin painting (after the purchase of a pumpkin), visiting with farm animals and more. Join the Farm Family email list to receive a coupon for one free child admission. Visit for the Pumpkin Hunt, weekends in October. Admission is free but some activities cost $2.50 to $5. Free activities include wagon rides around the farm and a petting zoo. Activities that cost $2.50 per ticket include a train ride, a maze, and face painting. Harvest of Fall Fun runs through November 8, 2013. Hours: 8:30 a.m. to 5:30 p.m. on Monday, Tuesday, Thursday, Friday, and Saturday; 1 – 5 p.m. on Sunday. Closed all Wednesdays. Admission is free and parking is free. The pumpkins and gourds are individually priced. Each activity has a fee. Activities include Scarecrow Island Hayrides, a Candy Corn Kid Maze, pumpkin painting, scarecrow stuffing, face painting, horse rides, sand art, The Sweet Berry Express Barrel Train, The Berry Bounce, and The ‘Texas’ Maze. Visit the Sweet Berry Farm website for pricing. Open weekends in October, from 10 a.m. to 5 p.m. The cost of admission is a canned food or monetary donation for Helping Hands Ministry. Activity tickets are $1 (activities require 2-6 tickets). Pumpkins and treats are for sale. The Pumpkin Patch is open daily October 7 – 31, 2013, from 11 a.m. to 7 p.m.